Description: Soundscape Turntablism music hack is a follow up of SoundscapeDJ, presented at the Hack Camp (Music Tech Fest, London 2012). 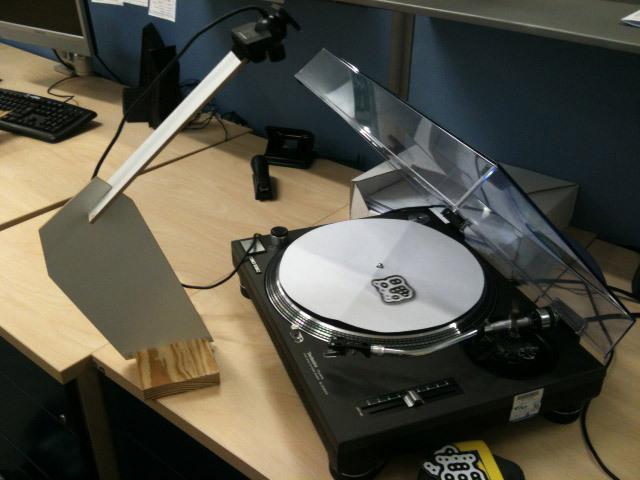 In this occasion we built a tiny homemade turntable using a DC motor. The motor is controlled via Sense board, which allows to map any sensors to the rotation speed. You can use reacTIVision fiducials as “records”, in this case, sounds from Freesound.org. The rotation rates of the fiducials affects the audio rate of the recordings. Role: Concept, part of the implementation and TUI design. Technologies: Freesound 2 API, SuperCollider, Freesound2 Quark, SETO Quark, reacTIVision, a Sense board. Acknowledgments: Robert Seaton, Ian Cameron, and the Electronics and Audio Visual Production Department (Faculty of Maths, Computing and Technology, The Open University).